The Irises are blooming. In fact, they've almost bloomed out. It's tradition: When I see the first Iris of the year unfurl I put out this dishcloth that my sister got me when we visited the botanical gardens many years ago. With promises made by the sun. Norma, thanks for sharing your flowers. Beautiful, beautiful things. I am always blown away by the colours. There are so many amazing colors in the Iris family, aren't there? A real pleasure to the eye Sandra. Thanks for sharing. I do love Irises. (Probably because my daughter painted them in high school:) There's such a wonderful variety of color isn't there, Lee. What a lovely garden. I love irises! They are one of my favorite spring flowers. Irises and daffodils. Have a great day. Your irises are far more beautiful than mine. I only have the purple ones. Yours are so much more colorful. Beautiful garden shots and that dishcloth is out of this world. Thanks, Elizabeth. I'm sure yours are gorgeous. I want to get another color. Sure a colorful display as they add to it at your bay. Wow, you have a lot of them. Hopefully, they'll be blooming soon, FSG. They're such elegant flowers and they last a long time in the garden. I took all of mine out last year because of some blight. I really miss them, and you've inspired me to put some fresh ones in! Thanks. We can't wait to see which ones you choose, Lee. Gorgeous Sandra!! No flowers here yet, but the grass is green! LOL! I love the dishcloth! Big Hugs! 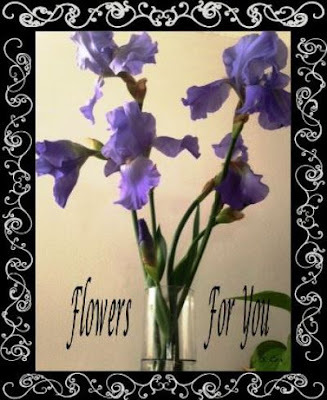 I just love Iris's, thanks for sharing your photo's. I am dazzled. I hope mine comes out. (I only have one!) Yours are just fabulous! Woman Adopts Cat. Returns to Shelter.